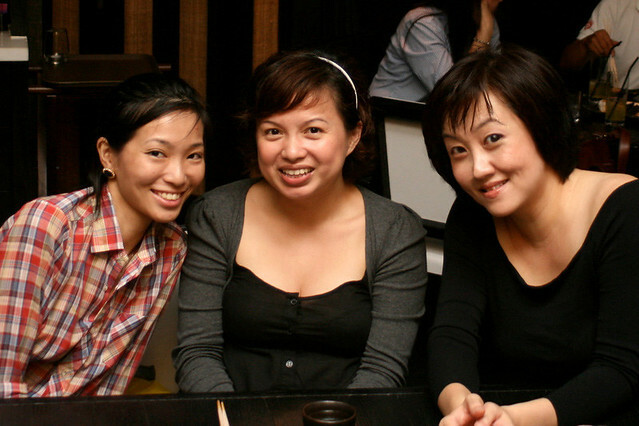 Our first dinner in Hong Kong proved to be one of the best. 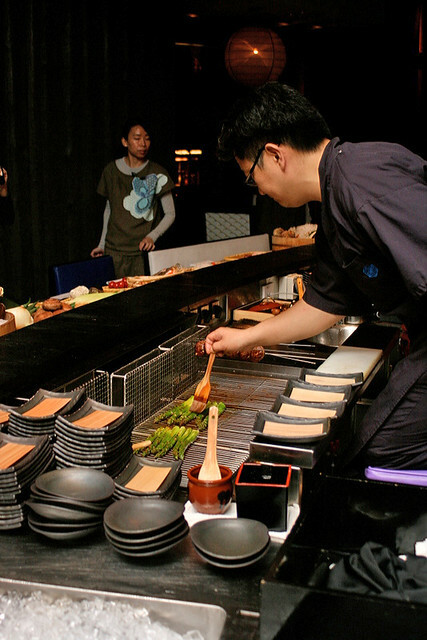 The Hong Kong Tourism Board arranged for us to dine at Busy Suzie, a Japanese robatayaki restaurant and bar. 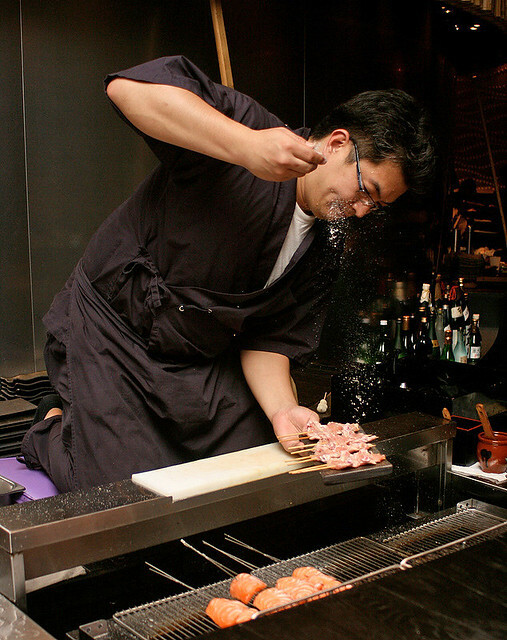 We were very privileged to have Chef Iwagami Yoshiaki serving our table. 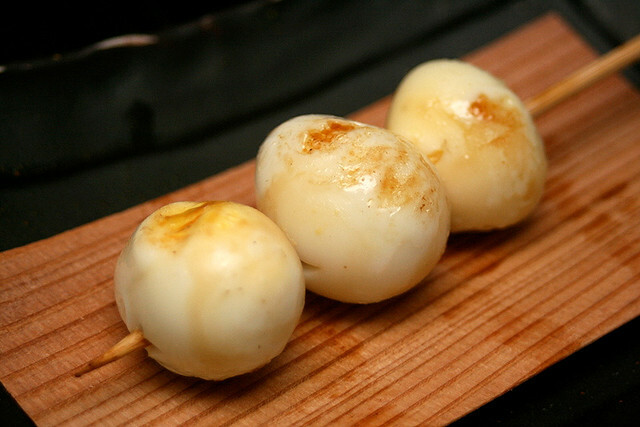 Robatayaki has its origins in Sendai, northeastern Japan, where fishermen would cook their daily catch over an open fire using little more than their wooden oars. 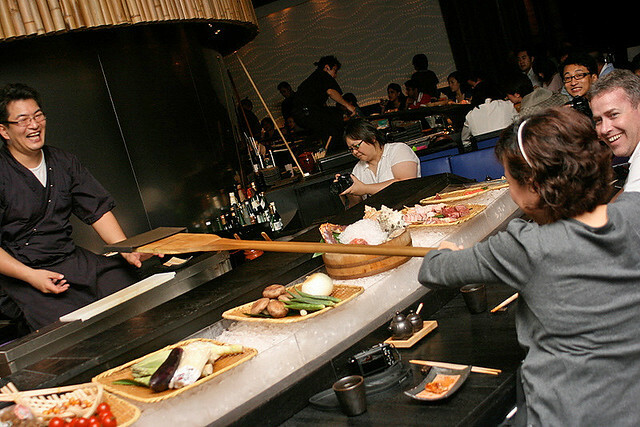 They would loudly announce when the food was cooked, and pass it using the oar to their customers. Those were makeshift beach restaurants, but Busy Suzie is a really hip and high-end interpretation of this. 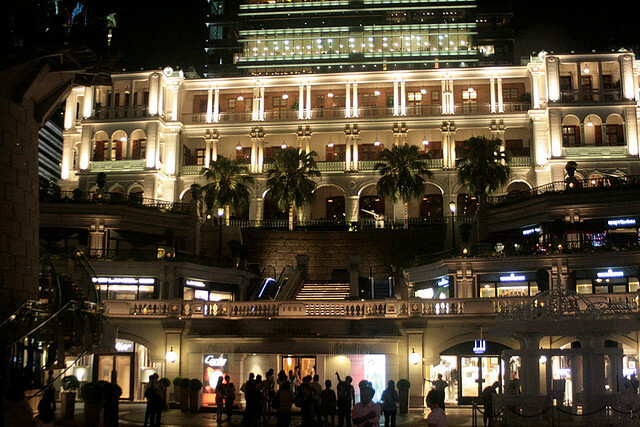 Busy Suzie is located at Tsim Sha Tsui's 1881 Heritage, the historic Marine Police headquarters that's been transformed into a magnificent hotel-shopping-exhibition complex. It's stunningly beautiful at night. The restaurant resides in the former lighthouse building where Hong Kong's typhoon warning signals were raised. The circular nature of the building really suits the restaurant. There's a terrace around it with white leather loungers for al fresco dining, and inside, the long curved robata counters ensconce hidden dining rooms. Interior design is by French married duo Patrick Gilles and Dorothee Boissier (previously lead designers under Phillipe Stark). Lots of dark wood, bamboo walls and white paper lanterns by Isometrix. This is the private dining room that seats 12. 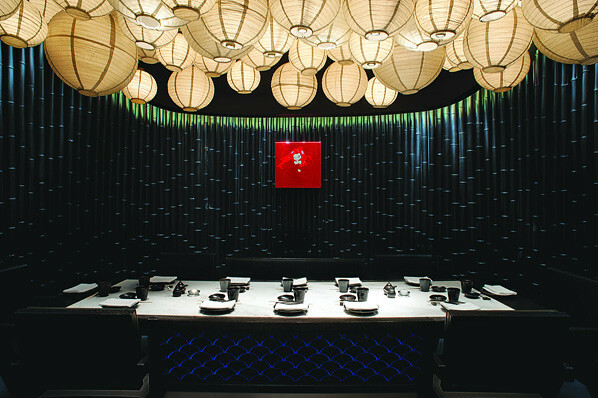 Founder Gilbert Yeung who also owns the dragon-i nightclub intended for Busy Suzie to be a stylish and fun place to put diners in an uplifted mood before a night out on the town. Busy Suzie's chefs are all brought in from Japan. 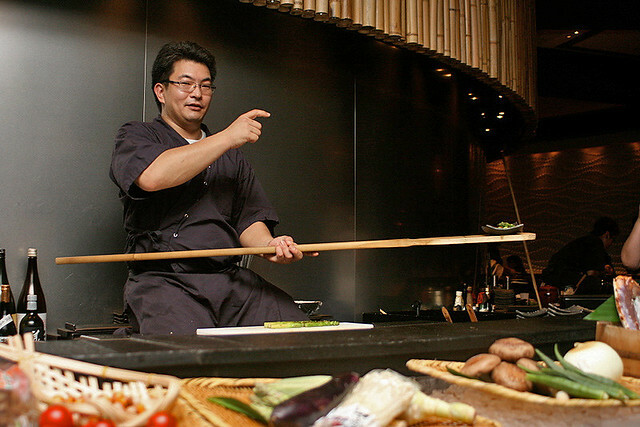 It's really hard work for the chefs, who kneel constantly on an elevated stage. They do all their work there - skewer items, bend over the grill to cook, and then plate each dish before finally serving it to diners via the wooden oar. In front of them lie the ingredients ready to be used. 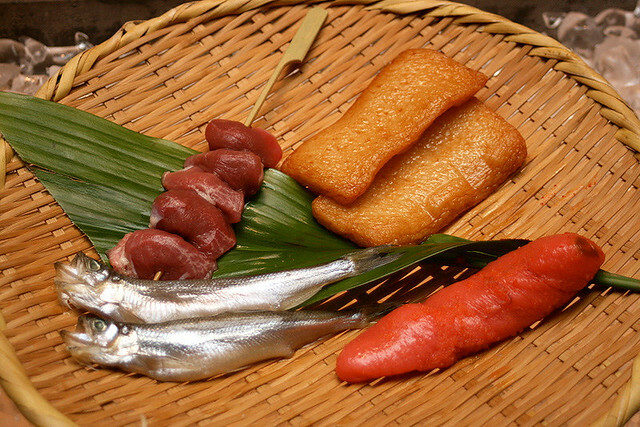 Busy Suzie seeks to have the finest and freshest ingredients flown in daily from many parts of Japan. Let me show you what some of these are. 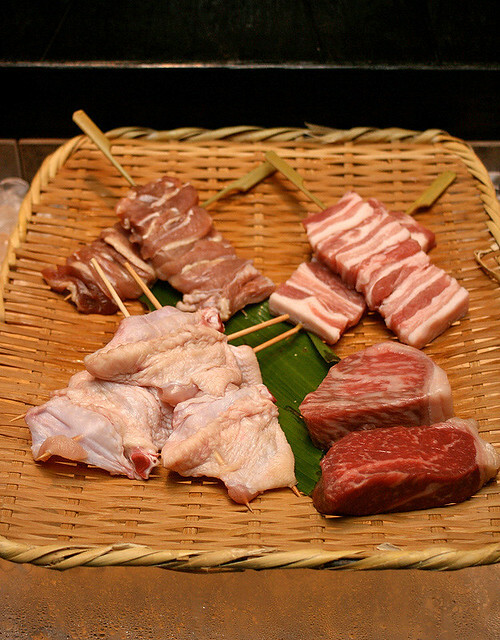 Raw meat skewers of various kinds - I'm eyeing the Miyazaki A5 wagyu sirloin (bottom right)! 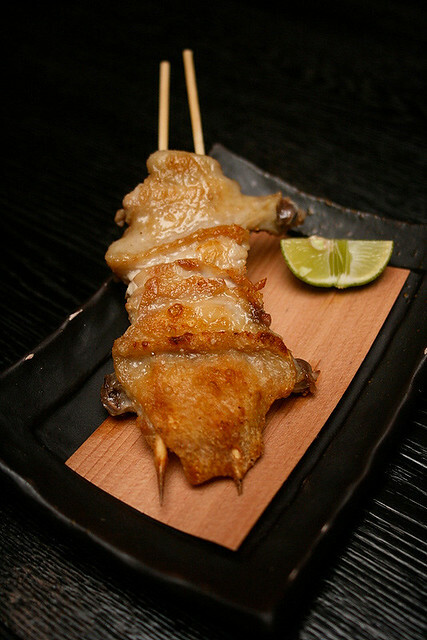 The Kagoshima pork skewers are also highly recommended. I can see why. Just look at the fatty streaks! 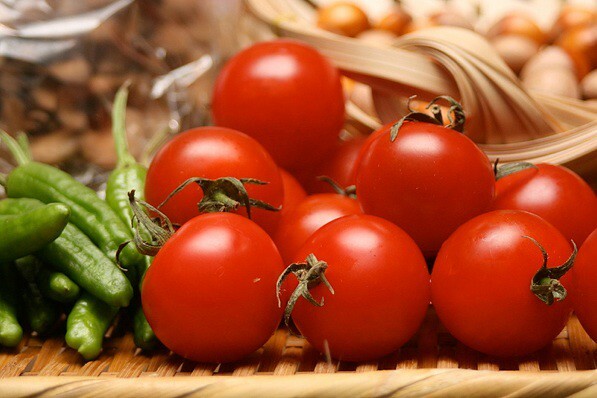 Tomatoes from Chiba that look so perfect, they're almost unreal! Too good to be eaten. And those are ginkgo nuts behind. Japanese ones tend not to be bitter. 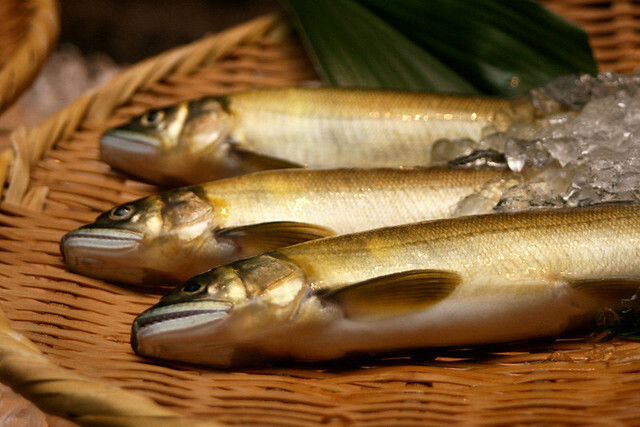 Ayu or sweetfish is in season. They look gleamingly fresh and perfect. Somehow their cute faces remind me of the black minstrels, no? Get your vegetables here. Some of these can be from Australia. Speaking of Australia, here's Aussie Pete exploring his inner Viking. Moving along to food. Oh they even import their chopsticks from Japan! Can you imagine? These are interesting ones - double-ended. 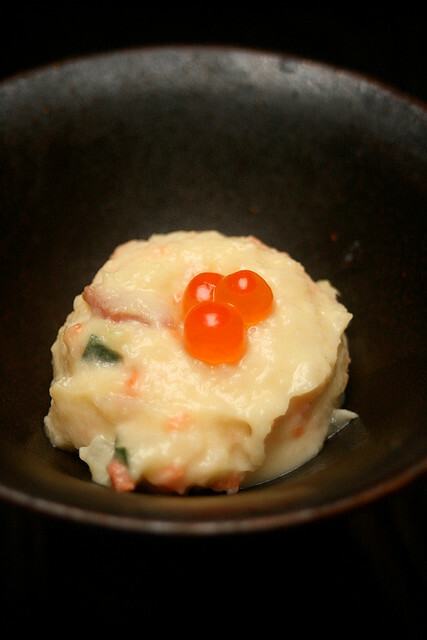 This dollop of Japanese mashed potato came first, probably an amuse bouche. Very nice and savoury. 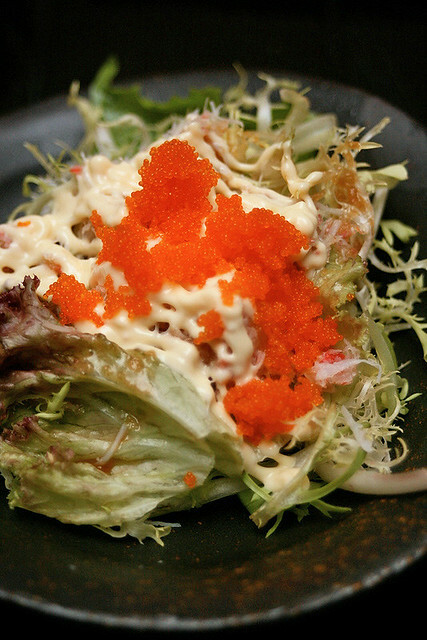 Appetiser of Hokkaido King Crab Fillet Salad. You can taste the shredded chunks of crab and the flavour of the sea. There is great anticipation as we wait for each course to be grilled and served hot. The chef announces loudly (all in Japanese, of course) that it's ready and invites the diner to partake in the food. 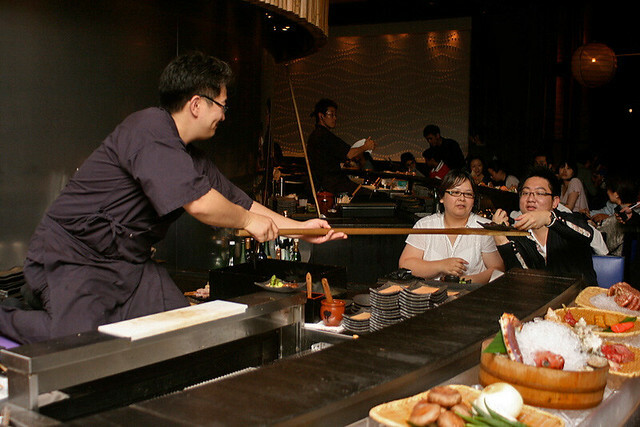 Servers in the restaurant are also constantly shouting orders to the chefs, who in return confirm the orders. The atmosphere is boisterous but fun. We started light with four kinds of grilled vegetables. 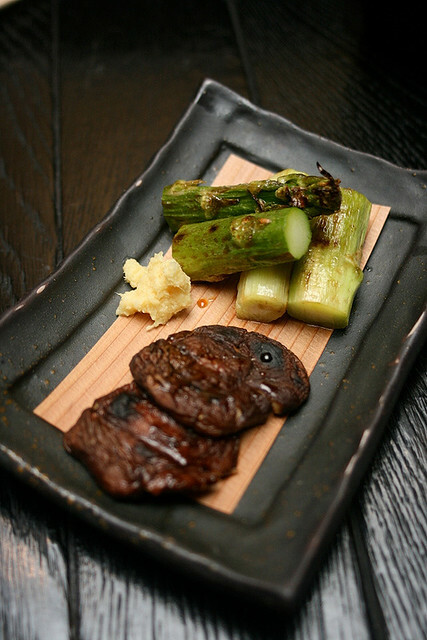 Very nice asparagus and shiitake mushrooms. 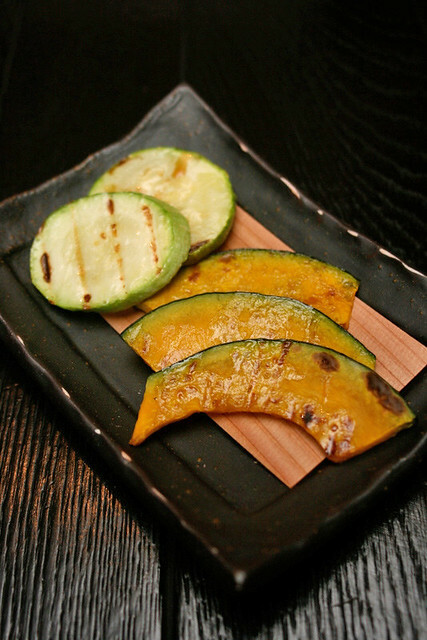 The grilled pumpkin still had a bit of crunch to it - quite unusual, since I only know pumpkin to be mushy. The zucchini was nice, but a bit too much like cooked cucumber for me. We got to choose a main each. This is Gin's platter of Kochi quail eggs. 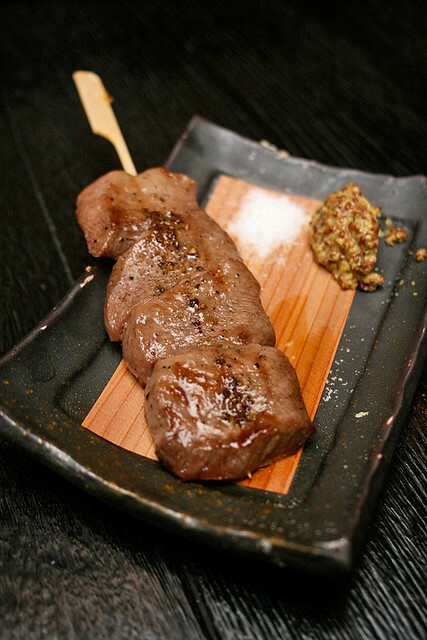 I went for the Beef Tongue or Gyu-tan. This can be quite tasty if you don't think about which part of the animal it is. Goes wonderfully with the grainy mustard. Geck Geck had the Kagoshima chicken wings. 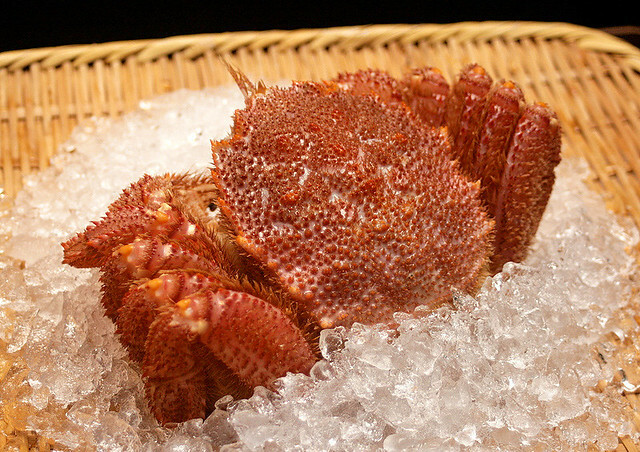 The skin is superbly crisp and well-seasoned. It's a marvel watching the chefs doing everything with deft skills and concentration. Even the scattering of salt is done with dramatic flourish. 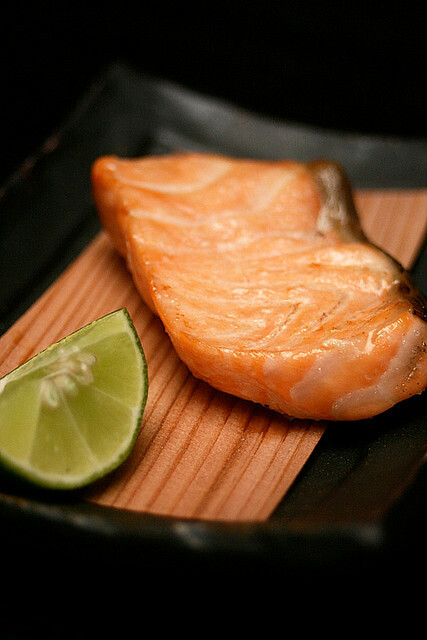 Ah they do know how to grill their salmon. It's very tender, with none of that dry, flaky overcooked quality. 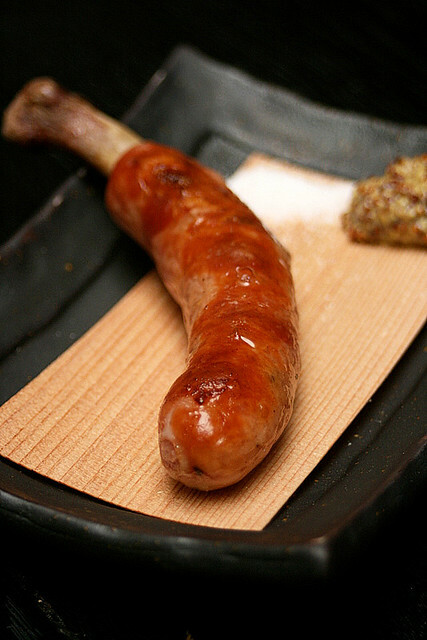 Grilled minced pork sausage, with a handy bone that adds a primordial touch. This was incredibly delicious. A little bit sweet like Taiwan sausage, but much more robust and meaty. 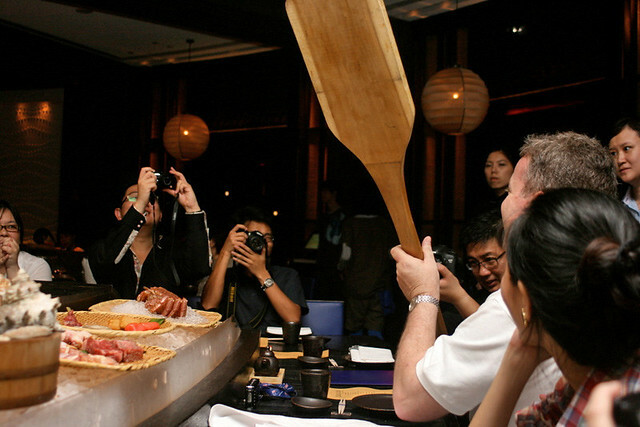 The chefs are quite happy to let us play with the oars, and to see just how heavy they are. Here's Gin trying her hand with the oar and a heavy ceramic tray. We got to choose between seafood fried rice and hot soba noodles. 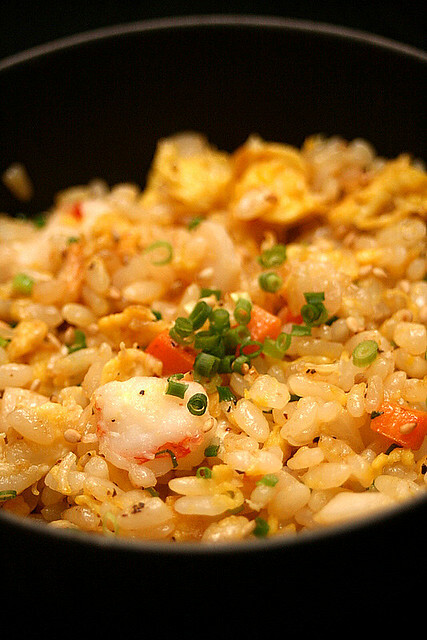 The rice is delicious with generous bits of prawn, scallop, fish and egg. 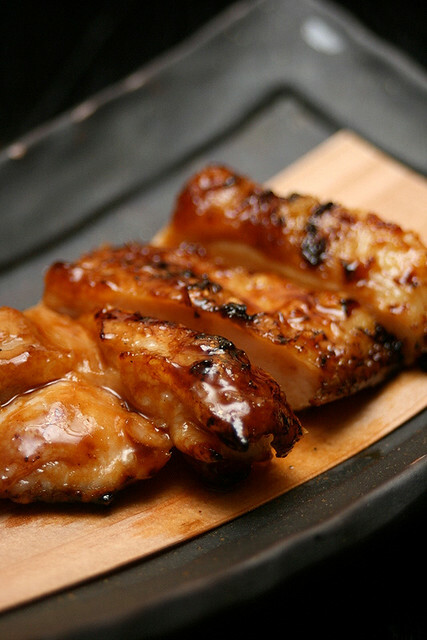 Grilled teriyaki chicken. This would go wonderfully with any rice. The yuzu jelly is amazing! 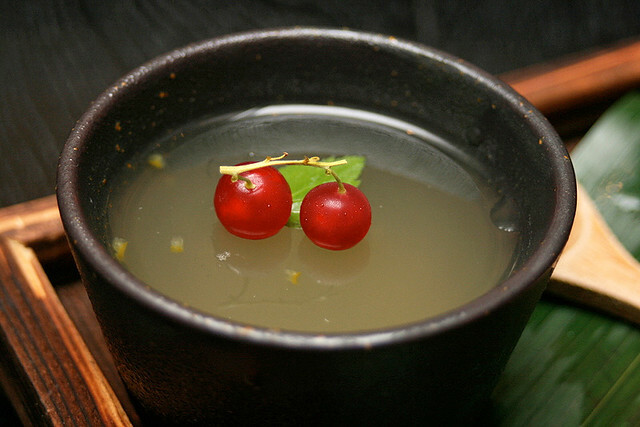 It looks so simple, but your first mouthful will bring forth "a surge of happiness", as aptly described by Gin. Bits of real yuzu peel add texture and fragrance to the dessert. とてもおいしいです! Photo by Iwagami-san. He's good with the camera too! Group shot with the chef and his oars! Top row - Gin, me, Geck Geck, Jerome. Bottom row - Sze Ping, Iwagami-san, Pete. This ends our first day's feasting. Gochisosama deshita! Thank you, Hong Kong Tourism Board, for the meal and introducing this place to us! 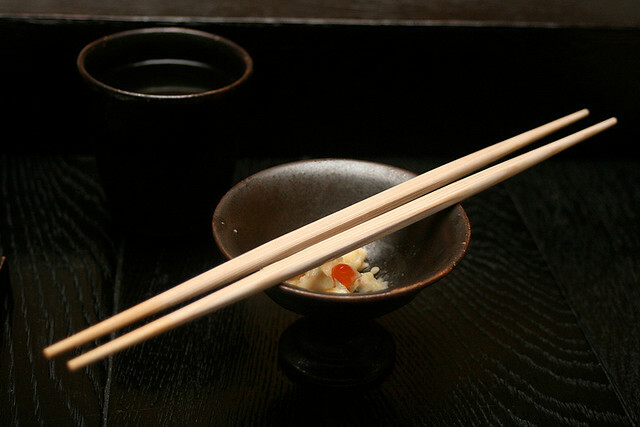 On your way out (or in as well), you will see pieces of modern Japanese art scattered throughout the restaurant. 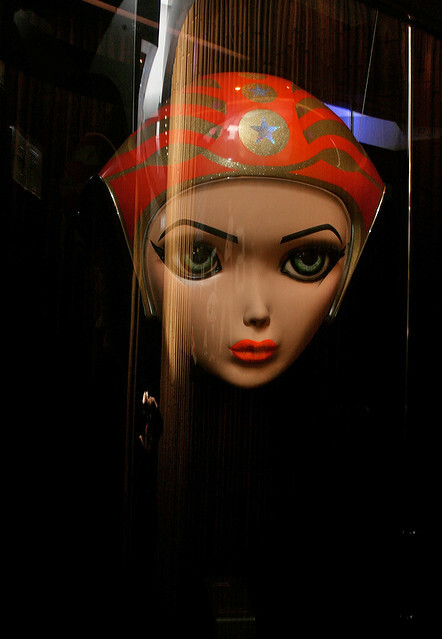 Here's a disembodied head made from fiberglass, called "Pop Star Gold" by artist Colin Christian. Somehow very Suzie, don't you think? 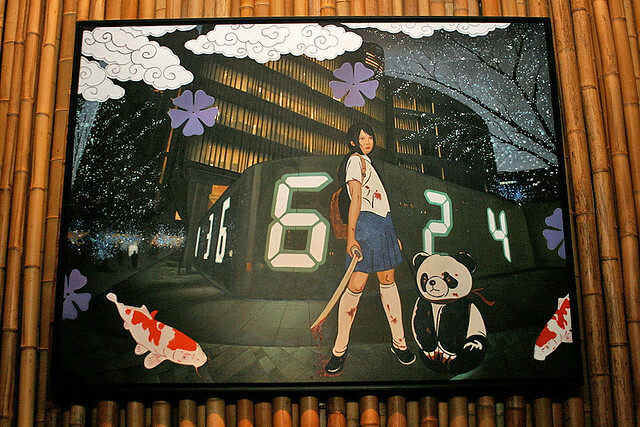 And facing the stairs to the restrooms is "36624 Roppongi" by Hiro Ando. Mildly disturbing. Carp should not be walking on pavement. This was a very good meal indeed. I'm so envious that Hong Kongers get to enjoy the weekend brunch buffet (noon to 3pm; HK$350+ per adult and HK$160+ per child). 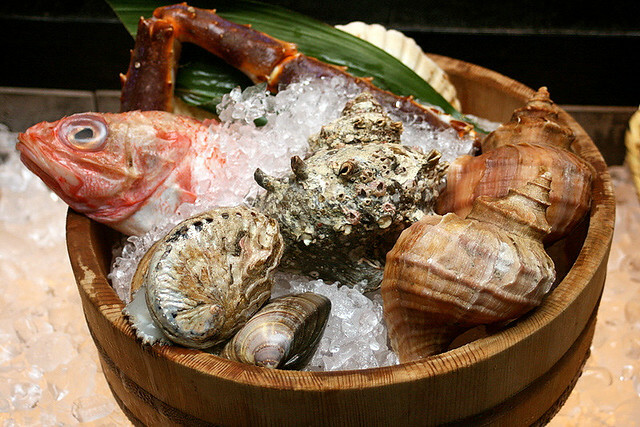 It includes marinated abalone, sushi and sashimi platter, and selections including beef tenderloin, chicken teriyaki, chicken wings, pork fillet, sausage, prawns, oysters, silver cod, squid, salmon and more. 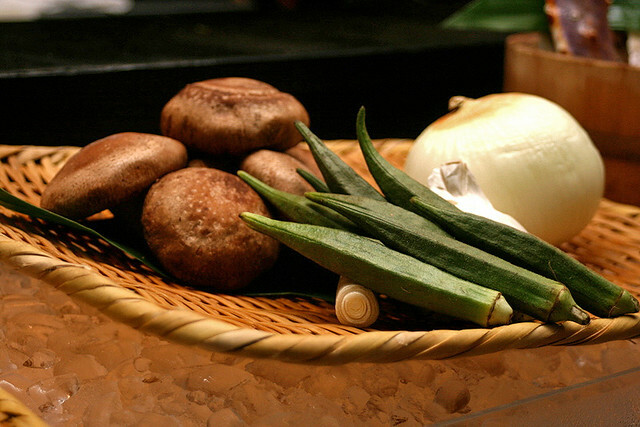 There's also tempura and vegetable selections, along with soba, inaniwa udon, fried rice, miso soup and a whole array of desserts to round things up. By now you can guess that the name Busy Suzie is a play on the word "Lazy Susan" - that turntable which delivers food to people seated at a large table. 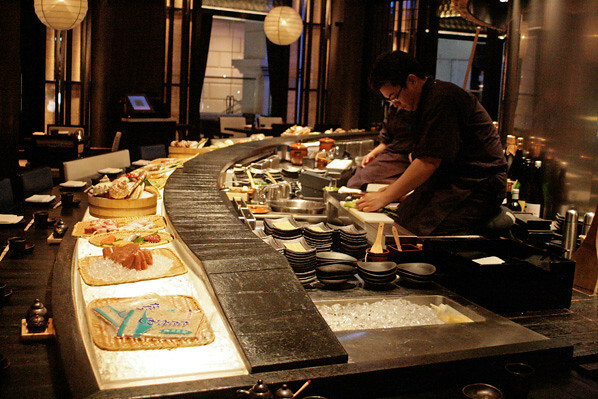 The chefs are the ones delivering the food around the long circular counter in a similar fashion. And they are very busy indeed. I love the atmosphere. This is certainly a cool place to bring a date, or to celebrate a special occasion. Great sharing ! Keep shooting ! Jinghui: Hey I'm so pleased to have a comment from you! And such a nice one too. Thanks for the Twitter RT! Enjoy your biscuits! Chenyze: I would go for the brunch too!! Oh, radiant? Ah must have been the good food, because we sure were all exhausted from waking up at 6am to go to the airport, flying and full day out before dinner. Thanks though! Cumi+Ciki: hahaha! Trust you to zero in on the bone-in-sausage! :) The tomatoes looked amazing - almost too good to eat. Too bad they were not on our menu. Oh, I know this building... it just opened not too long ago and it is across the road from Marco Polo HOng Kong where I always stay... Time to cross the road and check things out...though I have a feeling it will be difficult for me to dine in this splendid restaurant alone... need to drag my distributor along..
such a coincidence! I literally just read a book whereby this protagonist was describing a scene at the robatayaki restaurant, and i was trying hard to imagine how it looked like, and now your blog post shows it all! i will upload my hk photos soon (haven't even got it off the camera)! it was great and the price still remains at 350 inclusive of free flow green tea and soft drinks. It was great and I introduced it to my friends in hk too. Hey Blessedunicorn, I'm glad you got to enjoy this too! Happy birthday Nadine and hubby! Fabulous Feasting in Hong Kong! MELT Adds BBQ to Buffet! I Can Has Light Saber Chopsticks!